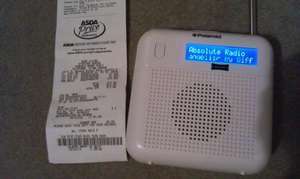 Just picked up a mini DAB radio from ASDA Living in Stafford. It said £20 on the shelf, but was £15 at the till. I presume this will be national. First deal so please be gentle! Level 1 common flamedeer, whoop whoop! !!!! and Polaroid is a good make. It does say made exclusively for ASDA, so probably just using the brand name. It seems pretty good, takes 4 AA batteries or mains. It also does FM radio. This is online too. It wouldn't let me select both on the mobile app. Now it wont let me add a link by editing it. This is online too. It wouldn't let me select both on the mobile app. … This is online too. It wouldn't let me select both on the mobile app. Now it wont let me add a link by editing it. Exactly, Polaroid went bankrupt in 2009, and the Polaroid brand name was sold off. £15 at Roehampton Vale... available in both pink and white. Deal posting newbie! This is ZeBadger first deal post. Help out by leaving a posting tip or just to show your appreciation for their contribution.